A detached retina is potentially blinding. The retina is the light sensitive tissue that lines the inside of the eye. 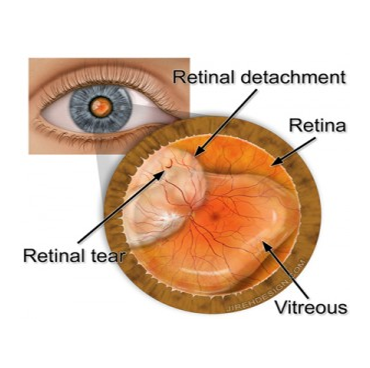 A retinal tear or hole usually leads to a retinal detachment. Floaters can sometimes be the earliest, and only, symptom. Many times there is little warning and a retinal detachment usually occurs without trauma. Visual prognosis is excellent if the central vision is not affected. This means that the macula, the functional center of the retina, remains attached. Prognosis is less than optimal if the macula is affected, that is, if the macula becomes detached. Other factors include length of detachment and patient’s age. Recommended dilated exam with your eye doctor within 48 hours of the development of new floaters, flashes or frank decrease in vision. Consult your eye doctor if you develop new floaters, flashes or decreased vision. You should also make an appointment with your eye doctor if you a history of myopia (near-sightedness), lattice degeneration or recent trauma. A retinal detachment, once diagnosed, may need immediate surgical attention. Retinal detachments can be pretty frightening. Often, I don’t get to see a patient soon enough as most hope the symptoms will “just go away.” Basically, the earlier I can diagnose and manage a retinal detachment, the better chance of doing well. The natural course of a retinal detachment is blindness. On rare occasion, with time, there may be loss of the eye. So there really isn’t much choice, but to operate in an attempt to repair the detached retina. Surgery for a retinal detachment is usually urgent. The timing and urgency of surgery depends upon the macula. If the macula is attached (the best situation), surgery may be scheduled before the macula becomes detached. If the macula is already detached (central vision is now reduced or absent), the timing is less imperative. This sounds a bit counter-intuitive I know. Surgery to repair a retinal detachment usually involves a vitrectomy or a scleral buckle, or both together. It is beyond my scope this morning to go into the surgical details, but these are probably the most common methods used today. Complications of surgery can be; increased near-sightedness, double vision, advanced cataract formation and others. There is a chance of blindness, as there is with any intraocular surgery, from infection. The rate is somewhere between 1 chance in 10,000-15,000. A detached retina usually stems from a retinal tear or retinal hole. Occasionally is there a history of trauma. Over the past 17 years of practice, however, I am aware of only a handful of patients who have developed a detached retina after trauma; including 3 patients that boxed. Most cases of a retinal detachment occur after a posterior vitreous detachment that causes a tear in the retina. Retinal detachments usually happen in normal, healthy individuals. 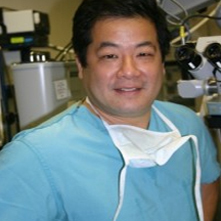 Surgery is required in most cases and is about 90-95% successful in reattaching the retina. Visual return is dependent upon age, length of detachment and involvement of the macula.